Discussion in 'Android Themes' started by AH1z, Aug 9, 2010. I'm offering a new theme pack (dock, and wallpaper) for users of LauncherPro named Droid Does Bleed. 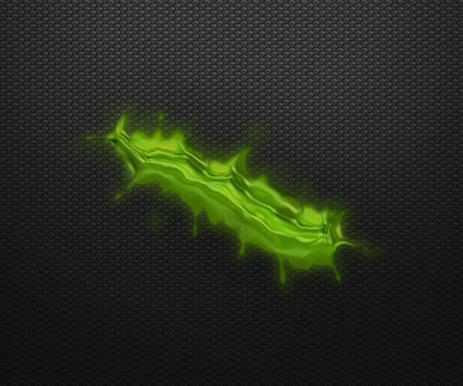 The wallpaper has a futuristic cell type background with chrome green Android blood. The dock is slightly lighter in tone with green dividers, and rivets. I also included in the download some Icons from Iconfinder | Search and download free icons. Icons are 128x128 and are smart-phone related. Some icons I have altered in size, or position to help fit smart phone / LP docks. Is 960x800 set for the htc evo or similar screen size phones. (dock & wallpaper) You may use this theme for personal use but please do not alter the names, or appearance with the intent of redistribution with out permission. Please do not use for commercial applications. Sev and darkside like this. any way you can fit that background only to the inc @ 480x800? 480x800 is attached to the post. I like the colors, nice.